It seems just like a few months ago we were publishing our best of issue for 2004, and now here we are doing it again for 2005. My how the time flies? 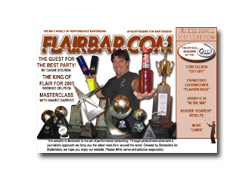 Each year we see major accomplishments in the Flair industry. From weighted colored shaker tins to our first Professional tour. Each year brings new hopes, new competitors and new competitions. Much of this wouldn’t be possible without the help of people like John Niekrash, Bill Hinkebein, Jim Allison, Ken Hall, JD Spradlin, Flairbar, Flairco, the FBA, BarProducts and all the people that watch our sport on tv and come to our bars and support us… and you our readers for taking our sport to new levels each and every year. As we look to the future we can see signs of an European FBA Pro Tour, a new Flairco portable bar, a Hall of Fame, new products and many more surprises. I am proud to be part of this sport and it’s growing family. 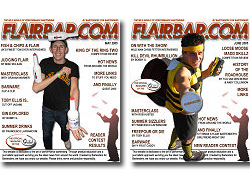 Now it is time to sit back and enjoy Flairbar.com’s Best of 2005! We start off with one of the biggest competitions of the year. A huge accomplishment for anybody especially only in your second year! The King of the Ring brought us big thrills and some minor spills. You can read the full review on our ‘Comp Reviews’ page. From of this years most controversial articles. Philip Duff talks to us about Tipping. Check it out on our ‘Articles’ page. Be sure to at least read it three times before forming an opinion! Next we go to one of my favorite pages of all time. 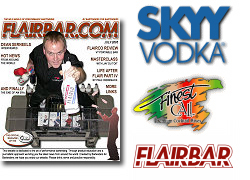 In case you missed it you on our ‘And Finally’ page we talk to you our readers and give you the microphone as you sound off on the Legends of Bartending and Flairbar.com. Thank you again everybody for your many kind words. Next we move on to Behnam Gerami as he shows us a fun two bottle and tin sequence on our ‘Masterclass’ page. Are you talking to me? A new face with us this past year was Pedro Morales. He tells it like it is and throws in an adjective now and then. 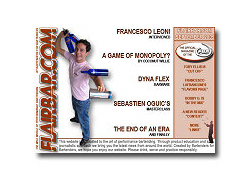 You can see what he thinks about the Flairco DVD box set on our ‘Reviews’ page. Flairco = Friends ;-). How could we talk about 2005 without bringing up this name? Rodrigo Delpech talks to us about his outstanding achievements in 2005, his brother and the FBA. All on our ‘Interviews’ page. No translation needed. Also, the Vice President of the USBG (United States Bartenders Guild) Nevada Chapter, Bobby G., is ‘In The Mix’ as he shares with us his insight and history on rums. Then we go to another one of my favorite articles this past year. Toby Ellis talks to us about the many, many, many benefits of free pouring. You can print it out and show your manager on ‘Cut Off’ by Toby Ellis. Be sure to knock them over the head with an Exacto Pour and stab them with a Spill-Stop #285-50 if they don’t read it. 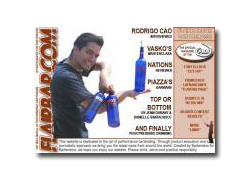 We have our first ‘Reader Contest’ of 2006 plus our regular features, more ‘Barware’, more pages, and more Flair than you can shake a 2005 Bartrix calendar at.